St. Martin's Press, 2000-06-01. Hardcover. Used:Good. 2000-05-05. Good. Ships with Tracking Number! INTERNATIONAL WORLDWIDE Shipping available. May not contain Access Codes or Supplements. May be ex-library. Shipping & Handling by region. Buy with confidence, excellent customer service! St Martins Pr. Hardcover. 0312208774 New Condition. . New. St Martins Pr. Hardcover. 0312208774 Like New Condition. . Fine. New York: St Martins, 2000. Softcover. Fine. Unc proof. Fine in wrappers, a paperback. Uncorrected proof. Corners lightly rubbed. Nice condition. Please Note: This book has been transferred to Between the Covers from another database and might not be described to our usual standards. Please inquire for more detailed condition information. St. Martin's Press, 2000-06. Hardcover. Good. St Martins Pr. Hardcover. 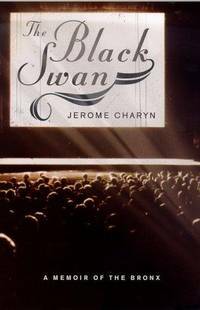 0312208774 Charyn, Jerome. The Black Swan : a Memoir. New York: Thomas Dunne Books, 2000. 182pp. 8vo. Hardcover. Book condition: Very good. Dust Jacket Condition: Very good; shelf wear, rubbing. . Very Good. 2000. St. Martin's Press, 2000. Hardcover. Acceptable. Disclaimer:A readable copy. All pages are intact, and the cover is intact. Pages can include considerable notes-in pen or highlighter-but the notes cannot obscure the text. St. Martin's Press. Used - Very Good. Very Good condition. Very Good dust jacket. St Martins Pr. Hardcover. GOOD. Spine creases, wear to binding and pages from reading. May contain limited notes, underlining or highlighting that does affect the text. Possible ex library copy, thatâll have the markings and stickers associated from the library. Accessories such as CD, codes, toys, may not be included.